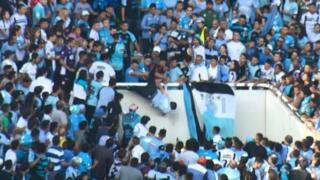 An Argentine football fan has died of head injuries - two days after being pushed from a stand by an angry crowd who thought he was a rival supporter. Emanuel Balbo, 22, had reportedly quarrelled with a man during Saturday's derby between his Belgrano team and the visiting Talleres in the northern city of Cordoba. Witnesses said the man had shouted that Mr Balbo was a disguised Talleres fan. He was then pushed over the edge of a stand, video images showed. He fell onto concrete stairs from a height of about five metres (16ft). He was taken to hospital with severe head injuries, where doctors declared him brain dead. Four people have been arrested over the attack, with the Argentine Football Association calling for "those responsible for this inconceivable assault" to be brought to justice. Campaign groups say more than 40 people have died in football related violence in Argentina since 2013.